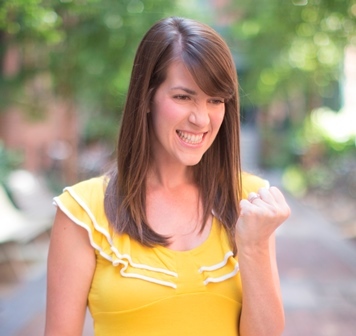 This guest post is by Leighann Farrelly , community manager of Yelp Boston. In the following article, Leighann discusses 10 simple ways you can take advantage of your business's presence on Yelp, one of the top user review sites on the Web today. Yelp makes it really easy and cost-effective not only to start, but to maintain communication with these potential customers by using a free suite of business tools. Create a Yelp Business Owner Account to join (or start) the conversation about your business today. By unlocking these free tools, you'll be able to update your business information, post special offers, announce upcoming events and, most importantly, communicate with your customers. Inquiring minds want to know, and here's your chance to give 'em the scoop, right on your Yelp business page. Once logged into biz.yelp.com, build out a rich profile under the "Business Information" tab. You can share the history behind your business and what you do best. Also, add a little something about yourself and your managers so that Yelp users can get to know you. Get photos of your establishment up on Yelp, pronto. If your business is a restaurant, add a picture of your menu. Own a boutique? Add a shot of your great new merchandise. It's a simple, fun and effective way to illustrate your story. Finally, ensure a photo of your storefront is included so people know what to look for when they decide to visit you offline. Got a website of your own? Why not add some Yelp badges to bring awareness to customers about your presence on Yelp? Check out the variety of buttons we've created just for business owners, which can be found on Yelp's Flickr page and downloaded for free. Once added to your site, hyperlink the image so visitors can jump directly to your Yelp reviews. Let's say you've just created a great new dinner menu. Or, you're having a sale on all your summer merchandise. It's easy to let current and potential customers know about specials and offers through the announcement tool . Simply create an announcement and publish it to your Yelp page. Not only will your message appear on your business page, but it will make you more discoverable within Yelp search results and on our popular mobile platforms. From promotions and discounts to unveiling a new location, announcements make it easy to get a simple and clear promotion out to Yelp users. To date, over 200,000 announcements have been created. What are you waiting for? 6. Do let people know you're on Yelp. Is adding a fancy Yelp button going to be enough to let customers know about your new Yelp page? While it's a good start, there are a number of creative ways make sure your customers are in the know. One of our favorite methods was found at a coffee shop where the owners provide free wi-fi. When customers logged onto the Internet, they were immediately taken to the coffee shop's preferred homepage: their Yelp business listing! Other business owners have proudly displayed favorite reviews in their offices or even at their front desks. 7. Don't ask for reviews or spam your page. While you might be eager to fill your page with positive reviews, we don't encourage you to solicit them from customers. Positive feedback is best, and most accepted, when it comes organically from customers who have had a genuinely great experience with your business. Consumers are turned off by a business with fake-looking reviews, and Yelp's review filter (a spam algorithm designed to maximize trustworthiness of Yelp content) weeds out most shills. Yelp users are a savvy bunch and come to Yelp for quality information to help them make purchasing decisions. While they often decide which opinions they trust on the site, our automated process helps filter out reviews from users that are less established on Yelp. It applies to both positive and negative reviews, and helps protect both consumers and business owners from malicious competitors, spam and generally less credible information. Our advice? Take the above steps to let people know you're on Yelp and then just go with the flow. Remember, it's all about quality, not quantity. Success is measured by the number of folks who view your page, not your review quantity. With a Yelp Business Owner's Account, you have the opportunity to engage in a dialogue with consumers who have reviewed your business. While it's a great way to build goodwill, it's important to consider your approach and tone; your reviewers are your customers, more vocal than most, and though you may have good intentions, meaning can sometimes be misconstrued through the Internet. With your business owner account, you're able to respond privately and publicly to customers who have reviewed your business. For positive reviews, a simple thank you works best. Avoid offering freebies as gratitude, as this may come across as an ex post facto bribe, and try keep your message short and sweet. For negative reviews, things can get a bit trickier. First, take a step back and deep breath. Though it may hurt to hear negative things about a business where you work so hard, it's important to consider your customer's viewpoint and experience. Avoid getting defensive, making excuses, attacking or blaming the customer -- this is your chance to establish a human relationship and make this situation better, even if it's just to let them know you are listening and appreciate their feedback. When you take the time to acknowledge their personal situation and address their issue, it shows and may even help to change the customer's perspective for good. Public responses are a simple way for business owners to add helpful commentary to any review of their business. It's an easy way to show customers that you are listening and that you're always looking for ways to improve upon their feedback. When it comes to positive reviews, a thank you is best communicated through our private messaging system. The public comments tool is best used to address how you've handled a specific concern raised by a reviewer, for example, to provide correct information if something is inaccurate or out of date, or to share your version of a difficult situation if you're unable to resolve the concern through private messaging. In any of these instances, it's important to remember that these comments will be viewable by everyone who comes to Yelp, including potential customers. That means you'll need to avoid using public comments to make personal attacks on a reviewer, advertise or offer incentives. This will only lead to a negative perception of your business and possibly drive away potential customers. You'll want to leave readers with a positive impression of your business, so take a diplomatic approach and stick to the facts. Customers appreciate it when business owners take the high road. 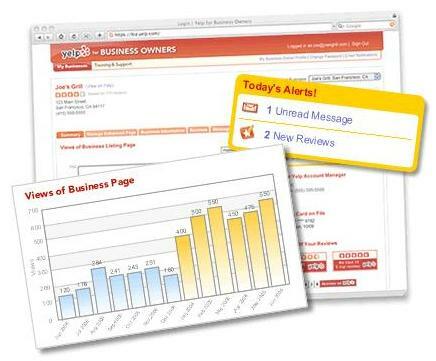 With your free Yelp Business Owner's Account, measuring your word-of-mouth is as simple as logging in to your account. You'll be able to check on the number of page views your business has each day and each month, an important indication of just how much buzz your business is generating. You can also opt-in to receive email alerts when new reviews are posted and track your review distribution and rating over time. Once you've completed your business page, uploaded photos, co-branded your online presence with Yelp badges and posted an enticing announcement, stick with it! Keeping track of your Yelp business page and your reviews, along with responding in a timely manner to those who've taken the time to provide you with feedback, only takes a few minutes a week and doesn't cost you a dime. By keeping the lines of communication open and being receptive to customer feedback -- both positive and negative -- you're putting yourself and your business in a position of great visibility to the Yelp community and potential customers in your area. Be consistent, be positive and be engaging!